Let me tell you something o. Never say never! I have tried this recipe several times with different chicken parts, but I have to say that this version is my favorite. I was making some scrub for my face with some turmeric and with the same yogurt and I thought to myself “sebi let me add this turmeric to this chicken?” I did and Nna ehn, I can’t even explain the feeling of the taste. For this recipe, the balance of the spicy was quite important to me. Most of us love spicy foods, but it’s hard for one to enjoy any meal with a lot of pepper. I know a family member who loves pepper, she would cook and over load the food with pepper and no matter how delicious her cooking tasted to her, it lost it’s taste to me. All you could taste was the pepper; which even as good as it is for you, you do not want it to over power your meal. 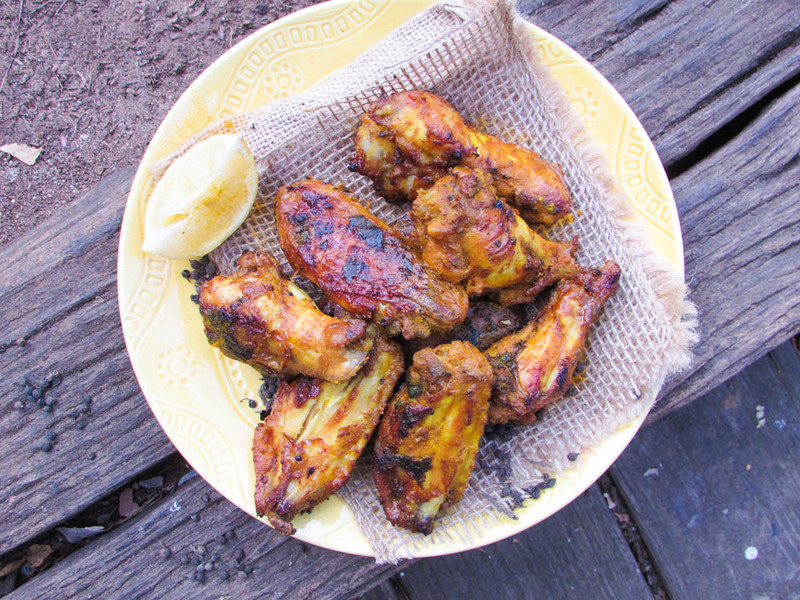 One spice I love and that went well with this recipe is Uziza(Piper Guineense). My fear was that it would get too spicy and clash with the Cameroon pepper. But no! This recipe was the perfect blend of tenderness and spiciness and we gobbled it up in minutes! It was Eureka good! PS: ignore the yellow color on the chicken. 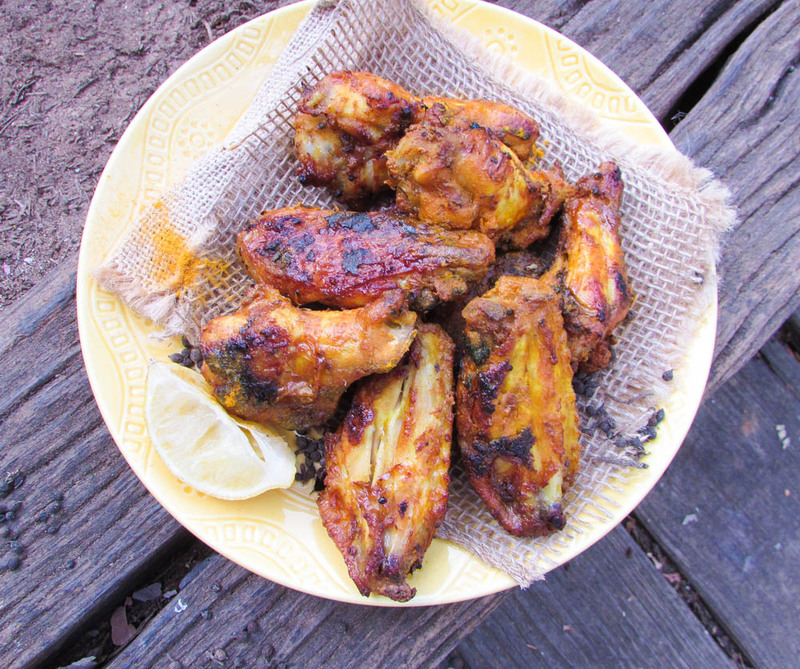 I mistakenly over dusted the turmeric over the chicken during my photo session. Massage the ingredients from option 1 into the chicken and set aside. Whip the yogurt with the ingredients in option 2 and pour over the chicken and rub into the chicken; using your hands. Pour the chicken mix into a lidded bowl or a storage bag and let it marinate in the refrigerator for 1-12 hours. Fire up your grill or oven to 350-375 degrees. If using an oven. Line a cookie sheet with a parchment or foil paper. (do not grease). Place the chicken on to the pan and cook for about 20 minutes; making sure to flip once. For extra browning, broil for about 1-2minutes after chicken is done. This entry was posted in Barbecue Chicken Recipes, Barbecue Recipes, chicken, chicken dishes, Chicken Recipes, Healthy Nigerian, Healthy Nigerian recipes, Holiday recipes, Nigerian small chops, Side dishes, Sides, Small chops, Uncategorized and tagged bbq chicken recipe, Grilled chicken recipe, Nigerian bbq chicken recipe, Nigerian food blog, small chops recipe, spicy chicken wings recipe, spicy uziza chicken wings recipe.